When dogs get upset, do they cry real tears like we do? Do they even have tear ducts? Our dog’s language is extremely intriguing. And, although they don’t talk the same language as us, they still have ways to communicate their feelings. Our dog might come up and nudge us if they need something. Or, some may simply want their own space for a while. We all know when our dog is happy… but do they cry when they’re upset? Do their feelings get hurt? Are there tears falling during times of upset? Yes, dogs do have tear ducts like us. And, anyone who has a Maltese, or a Poodle, can attest to that. They are particularly apparent if your dog is pure white. Dog lovers who have a Maltese or Poodle are continuously wiping off the corner of their dog’s eyes due to their tear staining. If the tear stains aren’t continuously wiped off, our dog will appear to be extremely unhealthy. And, it’s probably not too comfortable for them either. Other breeds may also have excessive drainage from their eyes. In technical terms, this phenomenon is known as epiphora. There are two types of tears humans and dogs share. These tears are known as basal tears and reflexive tears. Basal tears are continuously produced to keep the eye moist. Reflexive tears protect the eyes from allergens or any type of irritant. Then, there are emotional tears. Dogs don’t share these with us. Emotional tears begin when we (humans) are overwhelmed, frustrated, or generally emotional. 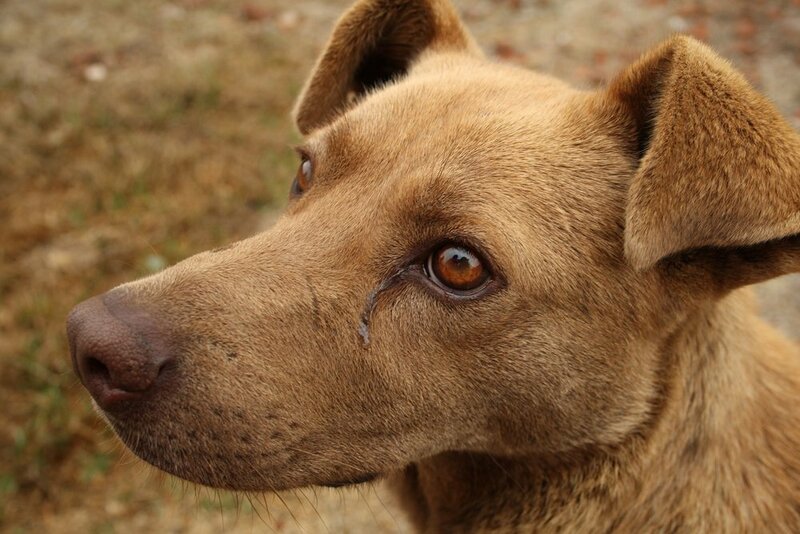 A dog’s tear ducts do not allow them to produce emotional tears. But, even though dogs don’t cry ‘tears’ when they’re upset, they still have their own way of letting us know. Why Does My Dog Look Like She’s Crying? Allergies: Allergies can cause a dog’s eye(s) to water… just like us. If your dog has allergies, your veterinarian should be contacted so you’re able to determine what she or he is allergic to. Blocked Tear Ducts: If your dog’s tear ducts are blocked, you may notice what appears to be tears leaving his eyes. Scratched Cornea: If your dog is active, there’s a possibility she may be ‘crying’ due to a scratched cornea. If your dog has a scratched cornea, she might also be blinking excessively. Irritants: There could be a speck of dirt in your dog’s eye, or some other type of irritant, causing tears. DO DOGS UNDERSTAND WHEN WE CRY? Yes, research has found dogs respond to our tears. They know when we’re upset based on our facial expressions and the tone of our voice. Research has gone so far to say many dogs can understand how we’re feeling without even seeing us in person. They’re able to tell by a picture. Even though it might look as if your dog is sad, and crying emotional tears, your dog isn’t truly ‘crying’ the way do. If you notice tears coming from your dog’s eyes, make an appointment with your veterinarian to find out the cause.